Cool Babies = Happy Mummies! 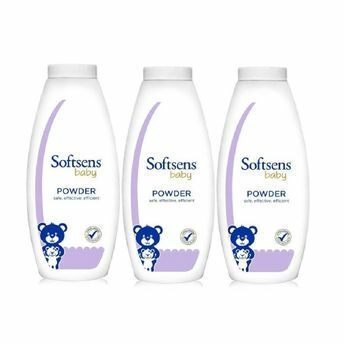 Softsens Baby Powder helps absorb excess moisture, keeping your baby's skin cool, clean & dry, yet soft & supple. Enriched with a mild & refreshing scent, it is gently formulated to help eliminate friction and control excess sweating, so that your little one stays cool, comfortable and happy. Keeps your baby's skin clean & dry. Enriched with a mild & refreshing scent. Keeps your baby cool, comfortable and happy . The powder helps absorb excess moisture. To be used after your baby's bath or before putting your baby to bed or during nappy changes.